It was mid September at this Wanna-Bee Campground wedding in Wisconsin Dells and the couple wanted to recreate the feel of one of their engagement pictures, except the picture had been in mid day. I said I couldn't replicate a daytime picture at night, but I can create an atmosphere with some lighting and make it interesting. I looked around by the edge of the woods for a good background. 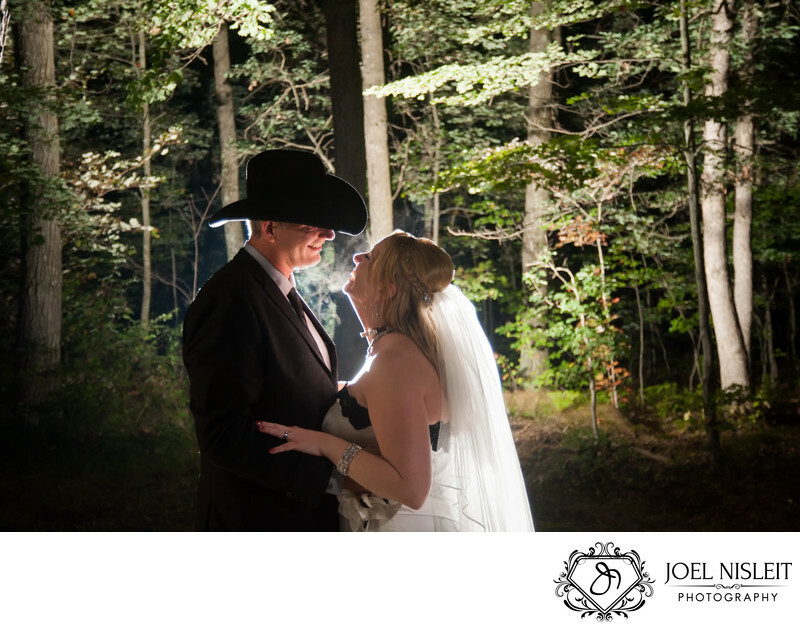 I set up a big light behind the couple to light the trees. I set up a smaller light to provide a rim light for the couple. And I simply let them have their own moment together, no specific direction. I made a series of portraits, but this is definitely their favorite because of their expressions, gesture and the little bit of breath you can see in the crisp autumn air.